Yesterday a friend and I took an overnight trip to Las Vegas. I got home a few hours ago and checked the blogs to see what I had missed. It was the usual stories of Britney and her underground baby fighting ring, pregnant Nicole in and out, in and out, in and finally out of jail all in the same day, and Anderson Cooper designing a line of titanium jewelry for gay men. You know, the usual stories. 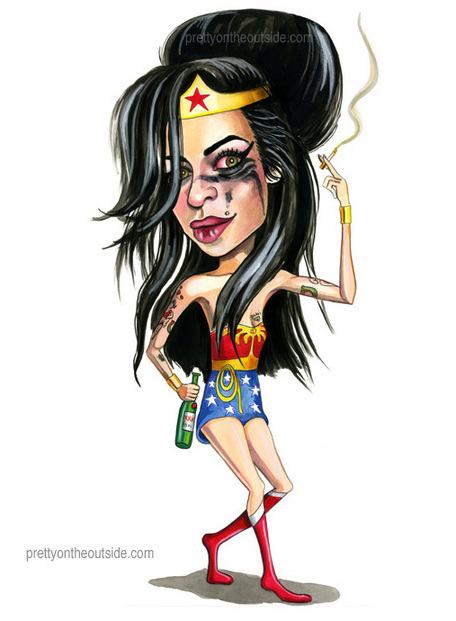 The one that really stood out was my precious but troubled Amy Winehouse had gotten into a fight with her husband. The husband was scratched to hell and Amy's eyeliner had been compromised. Call me crazy, but ever since I caught a glimpse of Amy's beehive hairdo, I've seen her as Wonder Woman. I don't know why but I've always had that association. Both are strong gals you wouldn't mess with. I hope my sweet Amy gets it together. She's a wonder Wonder Wino! Watercolor, gouache, colored pencil, and ink on paper. Next, I wanna see Titney Lears as BatGirl. Your work is amazingly accurate. I'm obviously a new comer. Truly great! I love Amy, but... well, your painting says it all.